The IBM 350 Disk Storage Unit Model 1 was announced, which was the first commercial storage unit to use magnetic disk storage, the technology behind hard disk drives. About the size of two refrigerators and weighing in at one ton, the 350 could store about 4 – 5 megabytes, depending on how it was calculated. The 350 would be an integral part of the IBM RAMAC 305 computer, which would be introduced 9 days later on September 13th. 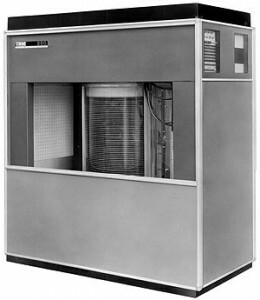 The RAMAC 305 and 350 Disk Storage Unit were designed to replace the punch card “tub file” system that was the primary means of storing repeatedly accessed data.